The newly erected Luxury Rosewood Corniche Hotel in Jeddah fianlly solved once and for all any potential waterproofing issues in the final stages of the construction. 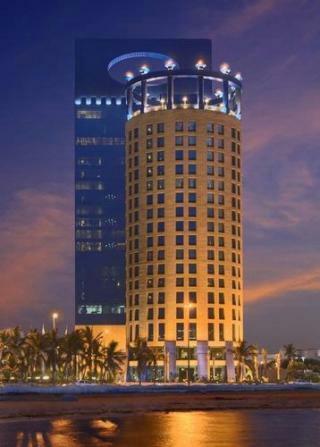 This spectacuar hotel is in the centre of the Corniche, a popular waterfront area said to be one of the most spectacular places in Saudi Arabia. It features over 400 open air sculptures and the gigantic King's Fountain, situated opposite the Al-Salam Palace. It has an open air rooftop pool, which is exposed to extreme weather conditions. Any leakage present could cause serious water damage to the floors below and even disrupt the hotel's operations. Isam Kabbani, Radcrete's Saudi representatives, had the perfect and inexpensive solution for this situation - Radcon # 7®. The specifiers were doubting this 'miracle' product at first but after realising Radcon #7® was the only solution claiming to fix any leaking cracks present as well as any future hairline cracking without re-applying the product, they gave Isam Kabbani the green light. Radcon #7® was spray-applied to the rooftop pool concrete surfaces and as confirmed by a successful pond test, will be protecting and waterproofing the concrete for the life of the structure. The product has been available in Saudi Arabia for several years and is building a solid reputation being used on landmark projects such as the Al Corniche, Jeddah Shopping Center and the Royal Terminal at the Jeddah International Airport.